There's a very good chance that rain will be falling for the evening drive. Rain showers during the morning commute already led to crashes, travel delays and frustrations for drivers. We know what to expect early, so do what you can to be prepared. 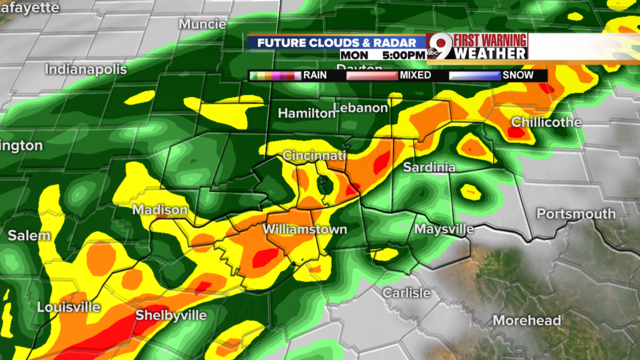 Rain will pick up in intensity from 3 to 8 p.m. today. This is when we could see downpours, lower visibility and a few rumbles of thunder. Evening commuters know that the first two on that list will slow down travel to and from the Queen City. Future clouds and radar around 5 p.m. Rain coverage and intensity doesn't drop off across the entire Tri-State until 8 to 9 p.m. which means those of you east of Greater Cincinnati will have to deal with this rain a bit longer.